The conflict in Syria has raged for over five years, creating massive destruction and human misery. Over 5 million people have fled Syria and over 6.6 million are internally displaced. Much of the suffering and conflict is being maintained by actors turning to a variety of illicit funding, and increasingly trafficking in the drug captagon. Unlike many other drugs the primary destination markets for captagon is countries in the Arab peninsula and increasingly Syria and the Syrian diaspora. Captagon has emerged as a conflict drug helping to sustain the war. For other drugs, particularly, Afghan sourced heroin, the instability and conflict has had the opposite effect of moving trajectories away from Turkey and Syria and north through the Black sea. Many long-established drug trafficking networks prefer a more stable environment to that found in Syria and neighboring countries. Within Syria people living under extreme conditions often turn to drug use, while soldiers from all parties to the conflict can use the drugs as combat stimulants. 6 million Syrian migrants and refugees in neighboring countries are an at risk community to drug use and acting as mules to pay for their travel to European countries. Though, the challenge of illicit drug trafficking and production in Syria is not new it has become a reliable war drug for many actors. International interest by law enforcement in drug trafficking is often limited by domestic political concerns. Yet there are long term public health and rule of law consequences for development and law enforcement actors that unless directly recognised now and responses planned for in a post-conflict Syria will lead to more suffering and instability in the region. This report looks at the current impact of drug trafficking and conflict within Syria and neighboring countries, discussing trajectories, development and organised crime response to the challenge and opportunity conflict provides. Drug trafficking and its impact on the rule of law is extensive and chronic, this must be factored into development implementation in a post-conflict Syria. Development policies should have a mid- to long term focus understanding the local needs, conflicts and development of the rule of law as a cornerstone for success. Conflict in South Eastern Turkey has shifted much of the Balkan route of Afghan opiates away from Turkey into the caucuses and across the Black Sea. Turkish OCG’s are exploiting the Black Sea trajectories due to the perceived increased risk and instability of moving Afghan opiates through Turkey. Captagon production within Syria has been occurring for at least a decade. The current conflict has exploited the breakdown of the rule of law to intensify production and trafficking with the direct involvement and enrichment of actors in the conflict. Most pills seized in the region contain amphetamine base rather than Fenethylline (captagon), although some seizures in Turkey have contained Fenethylline. The current level of conflict within Syria has forced some traffickers to move production of captagon to Lebanon and Turkey and potentially other countries within the region including Sudan. If the conflict worsens for either the regime, FSA, or ISIS1 and extremist groups, captagon drug trafficking could be moved on a larger scale to neighboring countries. Trajectories for captagon produced in Syria are by land, sea and air, controlled by OCG’s affiliated with forces on the ground within their area of control. Sea trajectories include containers of captagon and other drugs transiting Libya for redirection to other countries in North Africa and the Middle East. Syrian and Turkish OCG’s are working directly with non-state actors such as the FSA and extremist Islamist groups to produce captagon within Syria and to facilitate exportation. It is unclear if ISIS is a net exporter of captagon due to other more reliable sources of funding (oil, extortion). However, there are clear links between Tramadol trafficking and ISIS. 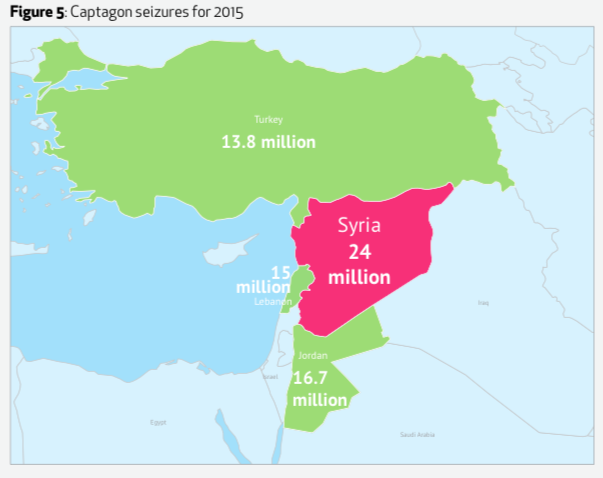 Huge data gaps remain regarding captagon usage in Syria and neighboring countries as well as destination markets, particularly among Syrian refugee populations. Destination markets for captagon are predominantly in the Arab Peninsula and East Africa with consumption in Turkey and Syria also rising precipitously. Drug trafficking and serious organised crime are a significant challenge to some countries in the region, due to newer priorities and limited capacity of drug trafficking is a secondary or tertiary priority to law enforcement. Limited reliable information on drug use and prevalence in Syria and the region.